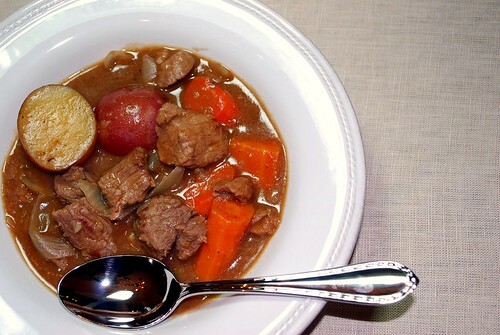 I like to put together a special Irish menu every St. Patrick’s Day, and a couple of years ago I was inspired to try to re-create the amazing bowl of Guinness Beef Stew that I enjoyed one night in a pub in Dingle, on the west coast of Ireland, when I was studying abroad there. Now it’s become one of my favorite slow-cooker recipes! Heat 2 tablespoons of olive oil in a large, heavy skillet over medium-high heat. Clean the beef and pat it dry. 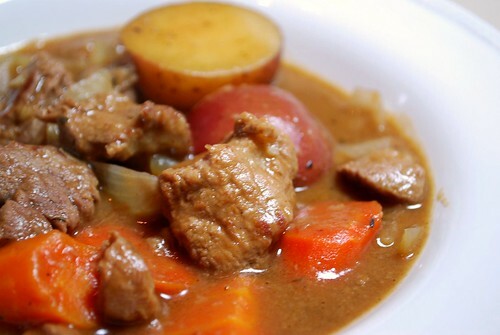 In a bowl toss your stew meat with the remaining 2 tablespoons of oil. Sprinkle with flour, salt, and pepper, tossing to coat all pieces. 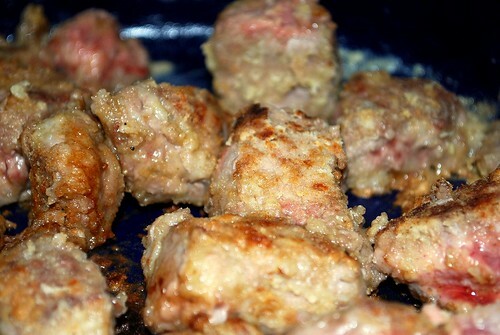 Arrange the meat in a single layer in the heated skillet. Cook just until the pieces are browned on both sides, about 2-3 minutes per side. Note that the meat will still be raw on the inside. Meanwhile, toss all of your veggies into the crockpot. Pour the Guinness and Worcestershire sauce over the veggies, sprinkle the thyme on top, and drop in the bay leaf. When all your meat is browned, pour it into the crockpot, too. Return the skillet to the stove and pour in the can of beef broth. 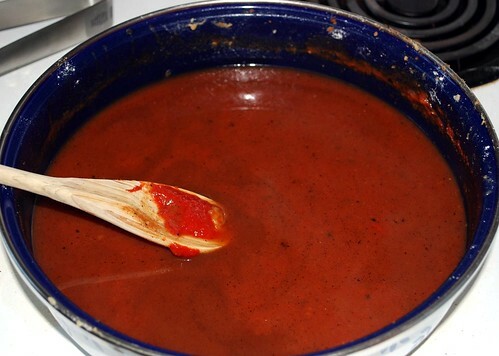 Stir in the tomato paste, and use a wooden spoon to scrape the browned bits on the bottom of the pan into the broth. This not only saves you some cleaning time but also ensures that you don’t lose any of the flavorful bits left behind in the pan! Pour the broth mixture over the contents of the crock pot. Season with salt and pepper, and gently stir everything together to mix thoroughly. 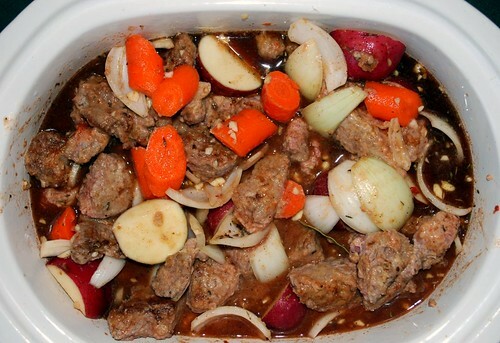 Put the lid on the crock pot, and cook on low for 6-10 hours or on high for 4-6 hours. Meat should be very tender (falling apart, melting in your mouth) and veggies should be fork tender (and wonderfully cooked in the broth). Remove bay leaf and adjust the seasoning before serving, adding additional salt and pepper if necessary. Serve with mashed potatoes, rice, egg noodles, or some hearty bread.